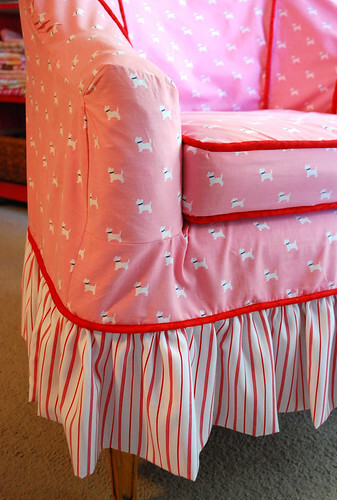 Tickled Pink (with scottie dogs!) - Stop staring and start sewing! Done! My chair cover is finished and it's 20 shades of cute!! I worked on it over the course of about 5 days and I'm glad I took my time. When I got frustrated I just walked away for awhile instead of pulling my hair out and usually the solution came to me when I gave my mind a break. I love this striped ruffle. It's a polyester or something shiny-ish but I couldn't pass it up at my favorite rumage-y fabric store. What a great, crisp candy cane stripe and it actually has a nicer flow for this purpose than cotton. The lower part of the arms were the trickiest part because of the curves on top and in the front. I just worked a little bit at a time and pinned and un-pinned (and ripped out more than a few seams). I kept the chair right next to the sewing machine while I was working (I've learned that running up and down the stairs can be tiresome with these sorts of projects although I guess the exercise is nice). 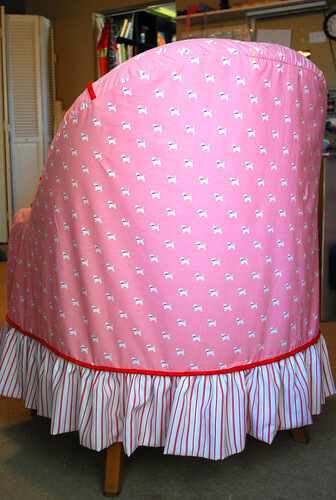 I really like the way the back turned out but I might have an overwhelming urge to applique a big scotty dog with a striped bow around it's neck right there in the middle (I'll let you know if I do it). I really want to do more big projects like this because I always learn something new and feel such a sense of accomplishment when it's finished. 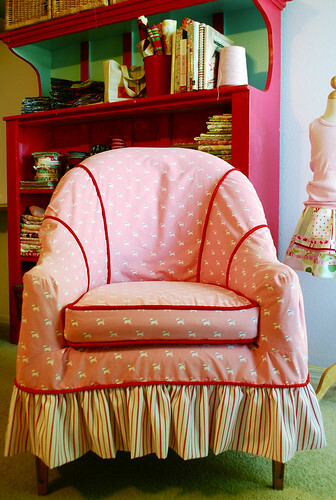 I went totally pink and frothy with my slipcover (weeee!) but if you want something clean and finished (and gorgeous) looking then you'll be completely inspired by Marie's cover here (and an ottoman!) and you can download instructions here (it's 10.00 but judging by every other gorgeous thing on her blog it's a very small price to pay). So, here's where I'll be this weekend. In my happy place, wearing my happy pajamas (post on those soon), reading this very happy book (filled with projects by a gal who's blog always makes me happy! ).